The Third Soviet Antarctic Expedition (1957–59) was led by Yevgeny Tolstikov on the continent and included Czech future astronomer Antonín Mrkos; the marine expedition on the Ob was led by I V Maksimov. Two diesel-electric ships were used to transport the expedition. RV Ob (flagship; captain I A Man) and Kooperatsiya (captain A S Yantselevich), used mainly as a transport vessel. The ships arrived in Antarctica in November – December 1957. Together with the ships crews the expedition consisted of 445 men, of whom 183 were scheduled for wintering. The programme included 6 stations: (Mirny; Vostok; Sovetskaya; Oasis; Pionerskaya and Komsomol'skaya). The first tractor-train to the interior left on 26 December, with 32 men. On 2 January 1958 the train arrived at Pionerskaya, and left again on the 8th. On the 17th they reached Komsomol'skaya; conditions of travel were difficult. A portion of the train (7 tractors and sledges) left on the 20th to relieve Vostok, arriving on the 27th, and delivering over 100 tons of cargo. On the 28th the train left for Komsomol'skaya, arriving on the 31st. On 3 February the train, with 27 men, left to found Sovetskaya; they reached 78° 24′ S, 87° 35′ E on the 10th, at an altitude of 3570 m. The station was rapidly constructed, and the train left on the 18th, returning to Mirny on 4 March, having completed a round trip of 4,000 km (2,500 mi). After spending the Antarctic winter at Mirny, the Expedition undertook a second set of tractor traversses starting in September 1958. One team reached the pole of inaccessibility and established The Pole of Inaccessibility station there on 14 December. Estonian writer Juhan Smuul took part of the expedition as a Soviet journalist and described the interesting details in his 1960 book "Antarctica Ahoy! : The Ice Book" ("Jäine raamat" in Estonian). ^ a b c "20 лет открытию Полюса недоступности Антарктиды: Метеорология и Гидрология. 1979, №3. Гидрометеоиздат" (in Russian). Arctic and Antarctic Research Institute. Archived from the original on 10 March 2007. Retrieved 26 January 2007. Nudel'man, A. V. (1959). Soviet Antarctic Expeditions 1955-1959. Moscow: Izdatel'stvo Akademii Nauk SSSR. (translated from the Russian by the Israel program for scientific translations, Jerusalem, 1966 for the National Science Foundation). Sovetskaya was a Soviet research station in Kaiser Wilhelm II Land in Antarctica that was established on 16 February 1958 and closed on 3 January 1959. The Pole of Inaccessibility Research Station is a defunct Soviet research station in Kemp Land, Antarctica, at the southern pole of inaccessibility as defined in 1958 when the station was established. Later definitions give other locations, all relatively near this point. It performed meteorological observations from 14 to 26 December 1958. 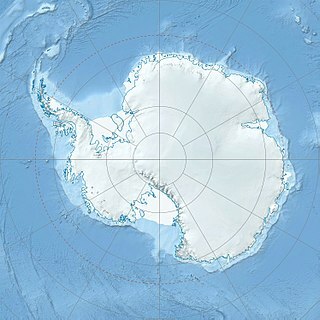 The Pole of Inaccessibility has the world's coldest year-round average temperature of −58.2 °C (−72.8 °F).